[minor arc] Dr. Franklin discovers an illegal medical establishment in Downbelow, which is stepping on the toes of his mildly-less-illegal medical establishment in Downbelow. Meanwhile, Lennier and Londo go out for drinks and a murderer is sentenced to the "death of personality." "I'm perfectly happy to inconvenience myself for your benefit. 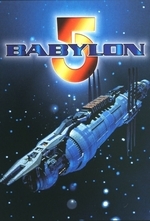 [...] Here my friend, here you will see the heart and soul of Babylon 5. Also its spleen, its kidneys--a veritable parade of internal organs." -Franklin finds an illegal clinic in Downbelow, which is hampering his ability to run his own illegal clinic in Downbelow. He's especially miffed as the doctor at the competing clinic, Dr. Rosen, is a former doctor who is now using unknown alien tech to heal instead of following proper procedure. Franklin talks to Rosen's daughter and learns that she had become addicted to stims and made a fatal error because of it. -Franklin learns that the machine heals by slowly killing the operator (sapping one's vitality); Rosen knows this but says that she has an terminal, incurable, and degenerative condition so the machine speeding up her death doesn't matter. -Particularly egregious crimes can be punished with the 'death of personality'. This is a Psi Corps-inflicted personality/memory wipe which programs the person to want to be helpful to others. Mueller, a murderer, is sentenced to this; Talia is the one to carry it out, which she finds upsetting to begin with. Mueller's crimes are much greater than was initially thought and she cannot carry out the mindwipe. -Mueller then escapes, but is injured in his attempt. He makes his way to Rosen's clinic for treatment, forcing her to heal him. Knowing that he is a murderer, she instead turns the machine around and kill him with it--curing her disease at the same time. Rosen's actions are deemed self-defense but she is ordered to cede her machine to station personnel, and she leaves. -Londo is told to make greater efforts with other species to cultivate allies. He goes on a drinking (Londo only; Minbari physiology does not mix well with alcohol), gambling, and ogling spree with Lennier. It turns out Lennier, with his grasp of probability, is very good at cards. -Londo cheats at cards by using strange Centauri tentacles, similar to those we saw on the Feeder in Grail. This sparks n large bar brawl, which Lennier smoothes over by lying. The final scene implies that Centauri men have 6 prehensile tentacle penises, which meant we were staring at penises the entire time. See also: the Centauri god(dess) Li, a god of fertility last seen in the feast scene from The Parliament of dreams, who presents as hermaphroditic -- with female breasts and male tentacles. -It is widely believed that Minbari cannot lie. They can--in order to preserve someone's honour. -June Lockhart (Dr. Rosen) starred in Lost in Space with Bill Mumy (Lennier). -By now, you should know that "my good dear friend" is Londo's 'tell' that he is about to screw you. Londo & Lennier buddy comedy would have been a killer spin-off. "I'm going to take a vow of silence regarding this entire conversation." I chose the episode's pullquote because, well, it stuck out in a bad way (it actually sounds, out of context, like something Mueller might say in the episode). "Vow of silence regarding this entire conversation" is an actual highlight. Also good job making a bunch of people look at dicks on TV in 1994; an impressive feat. The monologue continues, balancing justice against mercy. I chose the episode's pullquote because, well, it stuck out in a bad way (it actually sounds, out of context, like something Mueller might say in the episode). In Watsonian terms, you have to remember that Londo is very much struggling with Earth culture and expressions - "nibbled to death by cats", the hokey-pokey, etc. In Dolyist terms, yeah, this is one of those episodes with writing that clunks in a lot of places. I really liked the fact that Centauri sexual organs were revealed to be so...weird and different from human; it underlines the fact that this universe is pretty diverse in a lot of ways, and even something that appears similar is different (I believe the pilot movie included a reference to the fact that when the Centauri first made contact with Earth, they tried to convince Earth that they were a lost colony of Centauri due to the superficial similarities in terms of physical appearance). The revelation of Centarui anatomy in this episode also helps to explain Londo's reaction to the na'ka'leen feeder back in Grail.